When a police officer is injured, getting them medical help is expected. But what about when that officer is a K-9? A new Illinois law allows E-M-T's to transport the dog to a veterinarian for treatment. Chief Jim Kruger with the Oak Brook Police Department was a K-9 handler earlier in his career. He says the dogs live with the handler and become part of the family. 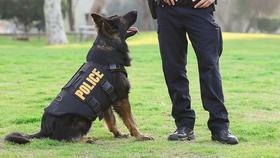 “Because of the strong bond you have with your K-9, that dog will give its life for you. The opportunity to get medical treatment for the dog that probably had performed in such a manner as to protect the handler, you want to do whatever you can to try to save him," Kruger said. He points out the new law only allows the K-9's to be picked up when no human needs care. "So I think there is still an understanding that people come first. But certainly if the opportunity presents itself, it will be a great option in a crisis," Kruger added. He says there is also a financial consideration. He says a dog can cost 15-thousand dollars or more to obtain and train.